Use to reduce fever and help the body fight viral and bacterial infections in children and adults. Fever-Infection is also useful when a person feels sick but the cause is not clear. 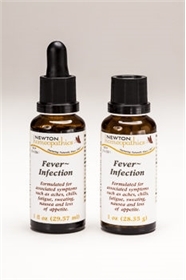 When fever rises too high with diseases such as a cold, flu, earache, sinusitis, indigestion, etc., the use of this complex is helpful in keeping the fever within reasonable limits. This helps the person feel more comfortable and allows the healing process to continue unhampered. Fever-Infection also relieves discomforts such as nausea, aching, exhaustion, and intestinal troubles that often accompany fever attacks. DIRECTIONS: Take 3 to 6 drops on the tongue every 15 minutes in the acute stage, thereafter every hour until symptoms are gone. For infected wounds, take a dose 3 to 4 times daily. INGREDIENTS: Aconitum napellus, Arsenicum album, Baptisia tinctoria, Belladonna, Bryonia alba, Ferrum phosphoricum, Hepar sulphuris calcareum, Phosphorus, Pulsatilla, Sambucus nigra 15x. China, Echinacea purpurea, Gaultheria procumbens, Salix nigra 3x. Alcohol 20%.